Since there was a request to speak briefly of the relationship of Apollon and Pan I am posting this. 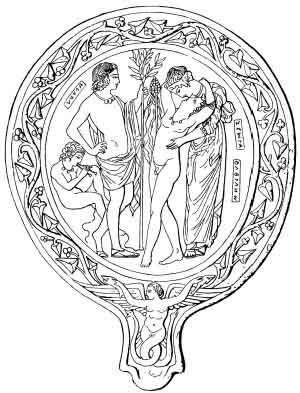 I speak of it is some in my chapter of Apollon Karneios in Crowned with Nine Rays which is currently transcribed onto my website Apollon’s Lyre (link is here on my blog page) but it deserves to be gone into a bit more. There is naturally a great connection between Apollon and Pan, especially with Apollon Karneios and Apollon Nomios, both of which are ram-horned aspects of Apollon and gods that are in same fashion connected with shepherding as well as a god of the pastures. This is mythically explained in that Apollon served as a shepherd to King Admetus for seven years (or one eternal year) in punishment for destroying the Cyclopes out of vengence toward Zeus. This is perhaps the strongest and most direct mythic connection to Apollon and shepherding, though this myth is likely based off an idea of Apollon as a god which predominates over this activity, as in the Iliad we also see Homer referring to the same function of Apollon in the dialogue between Poseidon and Apollon wherein Poseidon reminds him that of the time that Apollon spent in Troy tending to the flocks. Such care of livestock associated with light is not all that unusual because we also know of the herds of the sun, and likewise the myth of where Hermes recieved his wand and prod come too from Apollon. Thereby we have three deities largely concerned with shepherding: Apollon, Hermes, and Hermes’ son Pan. Aside from his identy as the son of Hermes, Pan is also an archaic type of deity outside of this myth. We see Pan presented by some poets as a god who taught the art of divination to Apollon (as well as gifting Artemis with her hunting dogs). Thereby aside from being sheperding gods we see also that theyare gods assocated with divination too as Pan had his own caves where such foresights could be sought. Even at Delphi there is a cave of Pan in the mountains of Parnassus. Even the Orphic Hymn suggests their strong relationship both in the hymn to Pan where he is addressed as Paian, and in that of Apollon where Apollon is address as the two horned Pan immiting the whistling winds. So there is a certain strong relationship between Apollon and Pan, though one should not be mistaken to think that they are same divine being. Rather, it suggests such a close relationship where there is complimentary alliance. Apollon is certainly connected with the windsas I said before of Apollon Telchinios, and this subject was elaborated further by Pausanias in regards to a city in which Apollon’s son Asklepios was associated with the winds (and these winds bringing forth good health…his daughter Hygeia). So it is a matter of identification…Apollon possesses characteristics of Pan, and Pan himself possesses characteristics of Apollon. This is likewise evident in the fertile nature of Pan that is exhibited in the natural domain of Apollon, the fertile light that aids in generation. It is hardly a surprise then to see Apollon and Pan close together in a scene of returning spring from a vase painting with Dionysos opposite of them. So this relationship is not so unusual if we consider another close relationship between Pan and Zeus, and how Apollon relates to his father that often intersects certain areas as a particular privilidge of Apollon. When it comes to the topic of fear (for which post spurred this discussion) the way that Apollon and Pan relate to fear is something that I believe is rather different. In the worship of Pan fear is the instinctive response of the unknown, and therefore such fears can drive unreasonable terror. Apollon’s association with fear is more of a mastery over fear…to confront and dispell unreasonable fear, and by gaining mastery over one’s own fear thus striking fear into others (and in such fashion the paian was said to have worked that the bolstered spirit of the armies singing the Paian was fear-inspiring as I spoke before of Apollon as Marshaller of the Host). Therefore we see Pan of nature who inspires fear because he is part of the unknown, and Apollon, the revealer, who brings mastery over fear. So of course even in this we will see Pan and Apollon closely aligned and both playing and important part. Hail Apollon, Hail Pan!